PG: Parental Guidance suggested for children 5 and under. On a thrilling ride, we spin back in time to an extraordinary prehistoric world: Alaska in the Cretaceous Period, 70 million years ago – the last great flourish of the dinosaur era. BBC Earth invites you to come on a journey through the seasons, and experience a year in the life of dinosaurs fighting, feeding, migrating, playing and hunting. 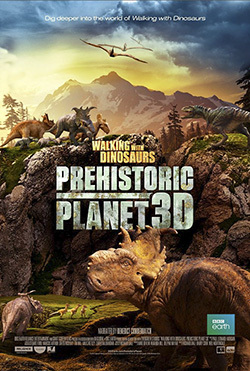 With the most ambitious CGI visuals, this film reveals the story behind the lives of the dinosaurs and the challenges they faced in a constant battle of survival. Fee: $5 Adults; $4 Seniors, Students, & Military; $3 Children (3-12); $2 Members. $5 Adults; $4 Seniors, Students, & Military; $3 Children (3-12); $2 Members.